Wow, I can’t believe the holidays are almost here. With everything to do I rely on lists, but not only lists of things to do, but writing lists. As I move into my edits of the novel before I send it to my editor, I’m relying on several tools to clean it up. An amazing book concerning Deep POV – Writer’s Guide to Character Emotion by Sherry Soule. It’s a must if you’re serious about deepening your writing! And, of course, a professional editor. I’m also looking into Voice Dream Writer. It’s an app that reads your story to you so you can easily identify awkward phrasing etc. While working on edits, I’m also beginning the outline for my next novel. I found this while conducting some research. 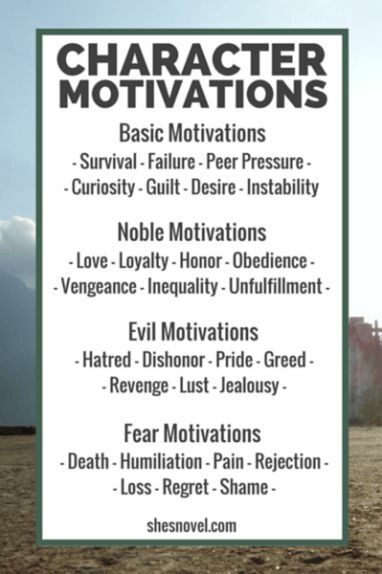 I like it because it’s a great reminder that your protagonist needs motivation and a solid character arc. If you don’t know what drives your character to their goal the story falls flat. Here’s some great ideas. Shesnovel.com has tons of fantastic information as well. Thanks. Never heard of voice dream writer app. Interesting. A thought on character motivation, another one is the need to belong. Excellent information. Thanks for sharing with us, Jen. I like the sound of that app that will read your manuscript back to you. Another trick I use is to read my book, chapter by chapter, starting at the back. It helps me make sure I haven’t left any loose ends. Your generosity of spirit shows in your willingness to help fellow writers.